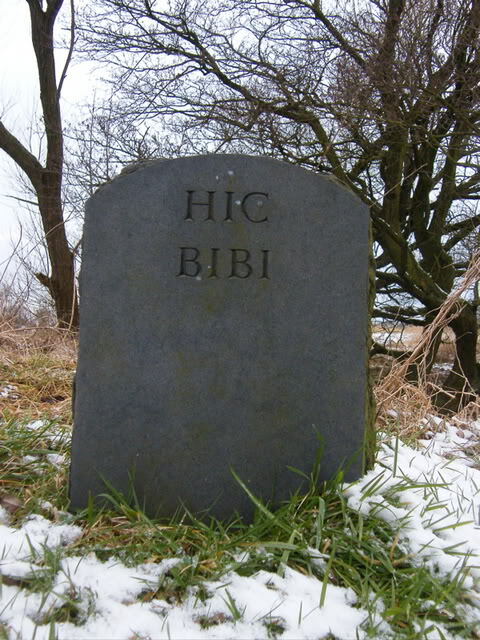 The Hic Bibi headstone was erected in 1997 by CREWS - Campaign for the Restoration of the Wells of Standish after receiving funds from such groups as the Wigan Archaeological Society. It marks the spot of an ancient and locally celebrated well which was seemingly destroyed by sand quarrying, though the spring seems to have surfaced again near by. 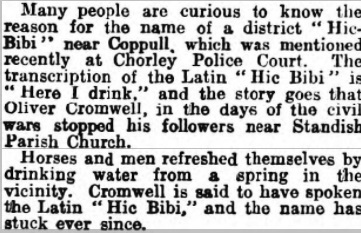 Local tradition has it that the name Hic-Bibi was given to the well of that name by Oliver Cromwell (he allegedly stopped to drink from the well as he chased the Scots though Wigan after the battle of Preston). Hic-Bibi well was one of three Holy Wells in the ‘Layland Hundred’ and the name Hic-Bibi means ‘Drink Here’. Seeing that the land surrounding the well was Monastic land, it is most likely that the Latin name was given by the Monks. There would probably have been some notice by the well to inform travellers on this ancient highway that the water was fit to drink. I have only come across reference to this beer house through a press article from 1868 shown below, when a John Fogg was refused a victualler's licence for the Inn by the Magistates. 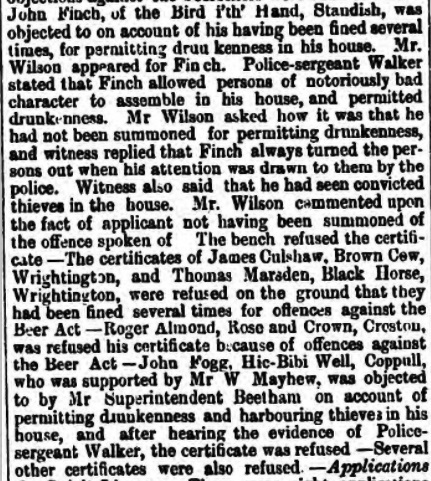 Whilst John Fogg was clearly unsuccessful in his application for a Victualler's licence in 1868 the following article confirms that he had later been granted one albeit a short-lived affair! 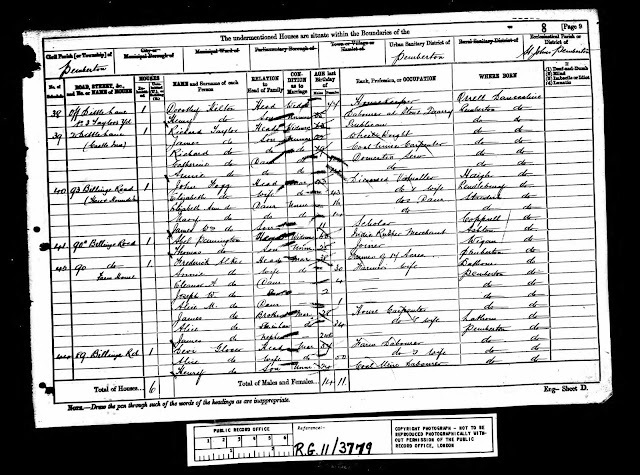 John Fogg appears on just once census in 1871 living on Coppull Moor Lane when his occupation was listed as "Grocer and Brewer". 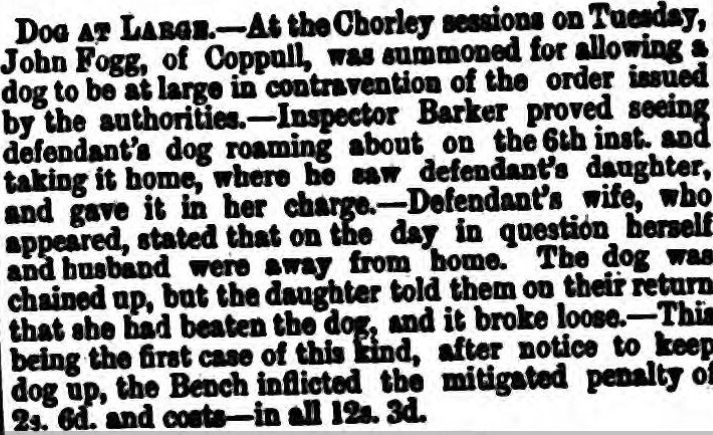 John continued to be no stranger to the local magistrates; indeed, having lost his victualler's license he looks to have diversified his trade to groceries and "British Wine", again falling foul of the law. 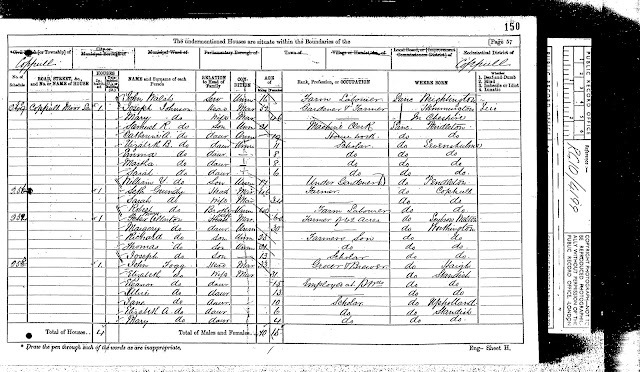 By the time of the 1881 census he had left the area and moved back to his native Wigan in Pemberton where John and Elizabeth finally did realise their dreams of running a pub, the Hare & Hounds on Billinge Road.